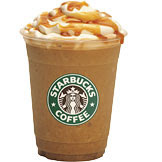 Drinking Starbucks Caramel Frappuccinos -- too much sugar and fat, I know, but it's like eating dessert with your coffee. Swimming in a pool (not lakes or oceans), especially underwater. I even love the smell of the chlorine. Barbecues and picnics. I love picnic foods: potato salad, burgers, almost anything grilled. Fresh veggies and fruits (I hate frozen or canned). Making salads with the veggies. Making smoothies with the fruits. You can open the moon-roof in the car. Eating outdoors at sidewalk cafes. Sitting (and dreaming) on front porches. What are YOUR favorite things about summer? I'm talking about normal, everyday things. Please comment and tell me! Hmmm....I like the busy days. There's always somewhere to go and something to do. I like strawberry lemonade and watermelon. I like the late days that make you feel like you get more done, too. @The Drama Mama -- yes, it's busy but in a nice way. You know, I was just putting all my winter clothes in a box, and I realized just how much we carry around during the winter -- hats, gloves, scarves, heavy coats, thick sweaters. It's so nice to wear light things and feel unencumbered during the summer. @Lizzie -- I just love having so much sunlight for so many hours. It makes me so much happier than the darkness of winter (I hate cold weather, anyway). Thanks for visiting! ooh, i hear you on the cold drinks from Starbucks. I love a simple iced latte, so refreshing. And in a move that kind of doesn't make sense, like you I also love having the sun roof open on my car, but i also usually have the air conditioning going too. I love all of the same things as you plus spending time on the different lakes around my area out on a boat. So fun and refreshing! What a great list! Usually we vacation in the garden state at the shore but this year we went to Lancaster. I missed it : ). My favorite things about summer are the lightning bugs, the late nights, the happy children, freeze pops, laid back days, schedule free weekends : ) you know...all that sort of jazz! Where I'm from in New England, lots of businesses and restaurants are seasonal and are only open in the summer. Some of my favorite memories are going to the local lemonade and ice cream stands for a refreshing treat. An ice cream cone or a cold lemonade still say "summer" for me! @Megan -- a boat on a lake? Sounds like fun! Thanks for visiting! @Life with Kaishon -- oh, yes, fireflies, freezer pops, lazy days -- I love being lazy sometimes! @Emily -- as a child we always went to the town pool and to the Dairy Queen -- I loved their parfaits! Ah, summer. 1.Having a glass of wine on the patio in the evening. 2.Watching the neighborhood kids catch lightening bugs. 3.Hearing the sound of the ice cream man's truck. @Karen@StrictlySimpleStyle -- Oh, I love the sound of the ice cream trucks! I forgot about that. We get two -- the Good Humor man and the Mister Softee truck. One of them has a ringing bell sound and the other plays a different tune each summer. Usually it's "Buttons and Bows" or "Pop Goes the Weasel." Number one is a biggie for me too! I really don't care much for eating outside but love the warmer temperatures, no snow, going for walks through the park and around the neighborhood and helping at our church's sports camp and VBS. I also love the smell of freshly cut grass. @teachinfourth -- *sings* these are a few of my favorite things . . .
@Karen&Gerald -- I love wearing lighter clothes in the summer and hiding hats, coats, scarves, gloves and boots in storage. I hate cold weather. I also love summer walks in the parks (we have many parks around here) and admiring the flowers. @KDC Events -- I love the scent of suntan lotion (esp. Coppertone), although I must use lots of unscented sun block for sensitive skin on myself. I have very fair skin (I'm a blue-eyed blonde), and it's extremely senstive to any perfumes. I also burn extremely easily. Popped in from Lady Bloggers to say hi! I LOVE summer! @The Blonde Duck -- the summer's great, isn't it? No heavy clothing or going to work when it's dark and leaving work when it's dark again.